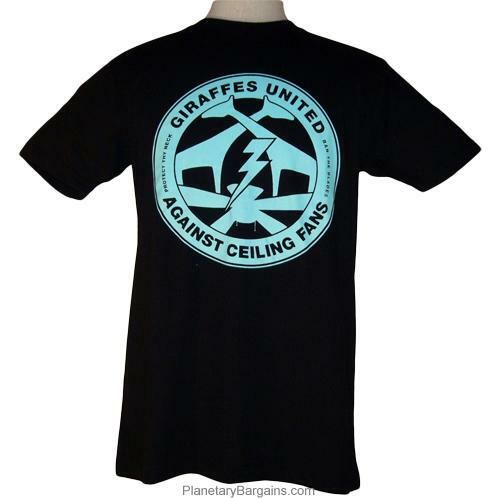 Own this 100% Cotton Funny Giraffes United Against Ceiling Fans T-Shirt. These shirts are preshrunk, durable and machine washable. To buy one of these limited quantity shirts press the orange button above now. For many years, humans have chosen to build their houses around us. Though their roofs are low, and unwelcoming, we have tolerated their presence. We allowed humans to walk freely through our home, never bopping them with our horns or stepping on them with our hoofs, and yet the humans covered their ceilings with horrible, neck damaging, dangerous fans. We deserve mutual respect, and demand our safety! We will bow down in their presence no longer! We will not be afraid to walk into human's homes with our heads held high, as soon the fans will be ripped from the roof and crushed under our hooves! 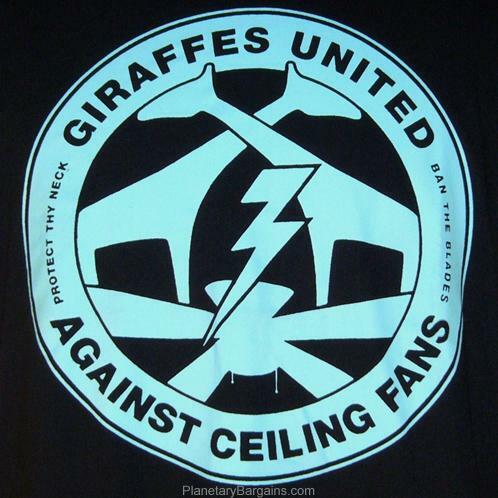 Rise up and unite my fellow giraffes, protect thy neck, and ban the blades!